So my problem I open up my contact to view the emails that have been sent via ClickDimensions, when I open the email I see the subject of the email that was sent but not the content. To get to the content I have to click the link to the email send record. This can be frustrating to users who what to get a quick view of the email content. This started me thinking, if we can view a preview in the email send record then maybe we can construct the correct URL and display that in an iFrame in any related record. After a bit of playing and an email with Matt Wittemann from ClickDimensions I had a nice solution. I thought I would share this and if I am honest as I am not a developer I would probably convert a couple of my steps into plugins rather than using workflows! Anyway this is how I achieved the solution. Now the only thing that changes by email send is the email send GUID. So if I know the GUID of an email send record then I can display the email in any iFrame, simple! What I did then was to use another workflow on the Sent Email to generate the URL into the Sent Email URL field, using the standard preview URL as above and populating the GUID from the related Email Send. This could equally of been done in a plugin on the create of an Sent email record. When I publish all of the components I now have the preview of the email that was sent displayed in my Sent Email record. Using ClickDimensions, how can I capture who forwards the email? Problem: People can forward my email to anyone and as such the links are related to the person who forwarded it and not the person who received the email. So how can I capture the forward? Unfortunately there is no easy way of doing this automatically, but what you can do and other customers do is add a button on your email, which states click here to forward this email. What this link can do is take a user to simple form that has a forward email box and a submit button. On entering the email and submitting the form we can then send an email to that new person with all the links correctly configured. You now what to add to your template a link or button (image) on to your email instructing the user to click here to forward the email. So the link you what to embed to the image is the link you copied in step 4. It is key that you do not use the insert web content feature and select the web content form as this will embed it with data on the person you sent the email to and thus prepopulating the email when the user clicks the button. So by using the link you copied no additional attributes will be copied to it, meaning it will be blank when a user lands on the form. You are now ready to send out your communication using the email template. Anyone who clicks the link to forward will have a new email generated out of CRM / ClickDimensions and you will be able to track the additional conversions and clicks. 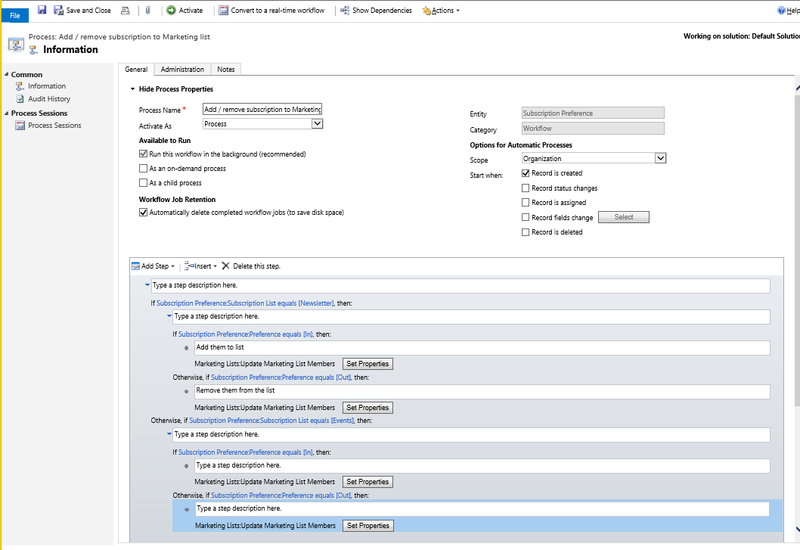 With the model above it does mean that you need to clone the forward form for each email that you send out with the forward button on it as it is specific to a email template. So once you have this created for each new forward email you need only update the workflow and not clone the form each time. How do I manage subscriptions with ClickDimensions? How do I keep my lists clean? Every marketing department wants some form of subscription management as a blanket un-subscribe is not ideal. Using ClickDimensions you have access to subscription lists. Subscription lists enable you to create areas of interest for your customers to subscribe to. Subscription lists can be added to one or more subscription pages using the standard web content record type. 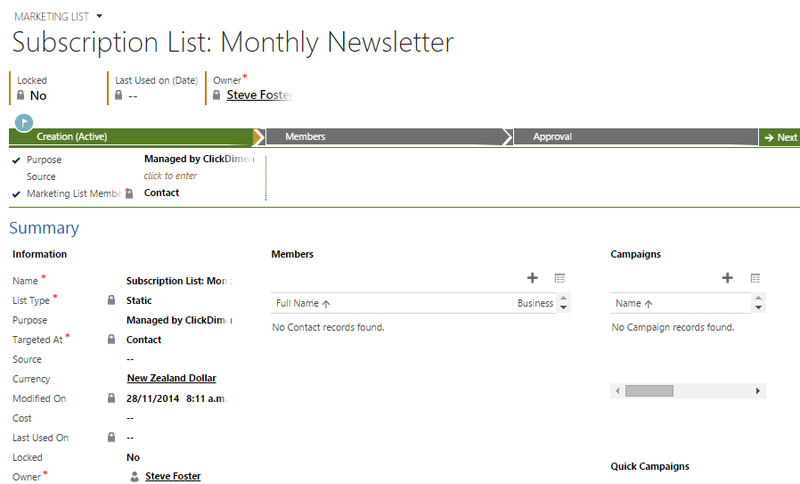 Once you have a subscription list you can then add it to an email you send out. All sounds good so far. The problem though is how do you maintain a nice clean list of contacts or leads who have subscribed to stuff? If you use ClickDimensions you probably know what I am talking about if not see here for the details http://help.clickdimensions.com/managing-subscription-list-opt-ins/ (no point me going into it here as well, as fully articulated in this great article by ClickDimensions). The basic point is that you either have dirty lists or need to add fields to the contact or lead form. But wait there is a better way of doing it now with the latest release of ClickDimensions that keeps your lists clean and does not require any new fields to represent new subscriptions. How you ask? Use the workflow custom step provided by ClickDimensions to add and remove users from a static marketing list. So how does this work, you ask? In the designer you will now have to add a condition per subscription list, and sub condition to see if the person opted in or out. 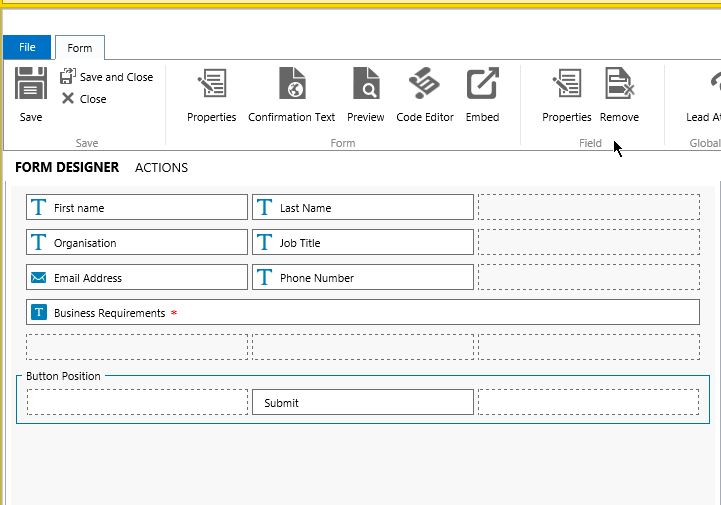 The action step will use the new ClickDimensions workflow custom step that can add or remove contacts and leads from lists. The second sub condition checks the value of the Subscription Preference Preference attribute. In resembles ticking the box, out resembles leaving it blank or unpicking the box. Repeat the conditions for each subscription list and then Activate and you are now done. Once you have activated you are up and running, your lists will stay clean, it will be easy for users to view what subscriptions a customer is subscribed up to and managed on going. Screenshot below is of the Contact associated marketing lists. Any questions let me know. Hope it is useful. Problem: I create a form using ClickDimensions but its quite basic and the formatting does not match our website, what is possible, how can I make it look a little more professional? Well with the latest release and the introduction of the code editor you can now update the CSS of the form and thus jazz it up a little, so how do I do this? Lets take the following basic example from Intergen.co.nz events page where we use ClickDimensions forms for capturing event registrations. 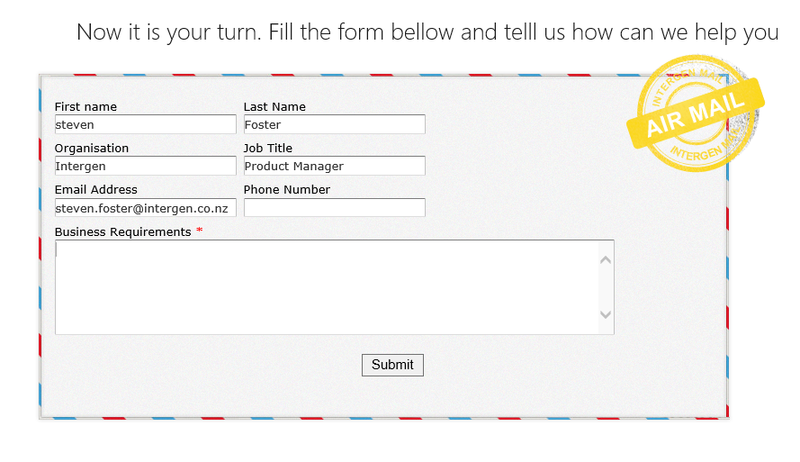 Our forms look like this and we are not using form capture. So in this simple example we have nice background image, some padding and the font matches our website. So how did we do this? For this simple example we just add a background image and some padding. Now when you select refresh you will see a margin placed around the form as well as the image you chose as the background displayed. Save and publish the form and you are up and running. So via the code editor on a form I can do some cool things to jazz up my standard form and make it a bit more interactive, use the HTML preview to help identify the CSS tags, you do need some basic knowledge of CSS to do this but lots of resources on the web. Problem: How do I easily export the Email send statistics into a report? In the past my options would of been to reproduce the report in excel using the email send and email event records or take a snapshot as an image. In the past the one missing feature of the award winning Dynamics CRM marketing add-on was the fact you could not specify a different reply to address for your emails. Well this feature is now included in the latest release but is a little hidden! You can find it in the Email Send Advanced Settings tab not expanded by default. Simple expand it and you can now specify a different reply to address. ClickDimensions Emails – Edge to Edge images using the Drag and Drop editor. Problem: When I use the block editor the images always have a white space between them and the email margin meaning that any proceeding text is slightly off line. Simple to resolve: If you are on the latest release, then use the Drag and Drop editor. In the drag and drop editor when you insert an image you can select via the style tab on an image the option to use Edge to Edge.